Welcome to the BigFatPurse show, today I am proud to invite the first foreign investor from Malaysia to the show. Touted as Asia’s Youngest Wealth Coach, he runs a few businesses and had appeared in numerous media programmes and publications. Ladies and gentlemen, I present to you, Jonathan Quek. Asia’s Youngest Wealth Coach, pretty big declaration, how did you come out with this tagline? It started about 3 years ago when I was giving talks to universities, financial institutions and corporations in Malaysia. I started giving financial talks in universities as part of my personal social responsibility. After 3 years, corporations and government agencies started paying me to speak. Soon, the media started giving me titles and someone actually quoted me as Asia’s Youngest Wealth Coach. When was it? How old were you then? I think I was around 23. It has been 4 years. So you are 27 now. Probably we can know more a bit about you. Maybe we can start the story the moment you graduated from university? I graduated with a bachelor degree in computer science while i was in Kuala Lumpur. During my university days, I was pretty interested in the area of personal finance and investing. I started reading books and magazines, trading stocks, and investing in mutual funds. After I graduated, I realized that my calling was in the financial industry. The first thing I asked myself was where could I learn more about the financial industry? There were 2 countries that came to my mind – Hong Kong or Singapore. Because the financial industry in Hong Kong & Singapore were light years ahead of Malaysia. The problem was I couldn’t understand Cantonese so the only option I had was Singapore. The moment I graduated, I left Malaysia for Singapore and I joined HSBC Insurance for around 6 months. One of my life-changing events was the Million Dollar Round Table (MDRT) Experience in Chiba, Japan. While all of my seniors were given the incentive to go for free, I had to pay from my own pocket. That was one of the best investments ever as I learned about the financial industry in US, UK, and Australia. I was truly amazed and the independent financial advisory amazed me. I went to explore this industry when I returned to Singapore. It took me around 2 months before deciding to join the premier & largest IFA in Singapore back then. After serving as an IFA for 2 years, I came back to Malaysia to set up my own wealth advisory firm. My first business venture did not do too well. It failed because of the partnership issue. My second venture was True North Asia Sdn Bhd. We started out as an alternative investment firm. A year later, our land division was sold to a Singaporean company whom my partner is currently managing, Capital Asia Group Malaysia, a real estate development company. Soon we started companies out of our divisions. Our precious metal division is now known as SilverMalaysia.com and our training division is known as Financial Intelligence Academy. That was how we started from insurance to unit trusts, financial advisory and to where we are today. The two partners of mine came from IFA in Singapore as well. In fact one of them is a Singaporean based in Malaysia. Pretty impressive! Considering that you have achieved so much in such a short time. What motivated you to start so many businesses? All our partners have our own area of expertise. Some of them love real estate. I love precious metals, gold and silver. I love training. I love seeing people grow when they increase their financial intelligence.Fortunately, we understood the concept of leveraging and we work on our individual strengths. We divide and conquer but we have a common goal that is to bring our company listed on Bursa KLSE. I believe passion is one of the key motivations. When did you start your financial education business? I started giving talks when I was an IFA in Singapore. At that time, I was also invited to some of the universities in Malaysia to give talks on financial education. I was also speaking for the SIAS MoneySENSE program. That is how I was exposed to the public speaking arena. Back then, I started talking about gold and silver. In actual fact, I emphasized gold and silver not so much as an investment but as an insurance of your wealth. Gold was trading at US$600 at that time and when it went up to $1,500-$1,600, people came back to me for more advice. I stopped buying gold when it was $1,200 and started buying silver which was trading at US$17. Since then, I was sought after by universities and corporations to give financial talks. What started as passion has since become a profitable business. You bought gold and silver at an early stage of the bull run. What made you so bullish about the precious metals? When I was an IFA in Singapore and was prospecting for clients, one of them asked me if I provide gold bullions. I said no because as a financial planner, I’m only licensed to provide paper assets. However, I had a wake-up call when he shared with me that if I am a responsible financial advisor, I’ve got to study the monetary system in order to provide sound advice to my clients. I heeded his advice and I started reading books he recommended. Soon I realised that there were a lot of flaws in the monetary system in US, Europe and the whole world. I started seeing gold as a protection of our wealth. When the world continues printing more money, gold and silver will just revalue to the amount of fiat money being printed. That is why gold has been moving up since 1971 and it has been bullish for the past eleven years. The theory behind gold and silver is very simple – it is the best hedge against inflation. You are expecting a pro-inflation environment going into the future, due to monetary easing by the central banks. That is why you have wrote a book, “Why Gold? Why Silver? Why Now?”. Maybe you can share with us more about the book? Many people have been talking about gold and silver and it seems there is a little hype going around. Is it too late to enter now or do you see gold and silver will continue to rise? I wrote this book because I wanted people to understand how the fraudulent monetary system works. I wanted people to understand that the Federal Reserve in US is actually a private bank controlled by private equity holders from Europe and US. By understanding the manipulation of the monetary system, you will understand that by converting your paper money into gold and silver, you are actually insuring yourself against these manipulators. While the media is excited about gold, I have been sharing for the past 2 years that silver is a better bet as I see silver as the best investment of the decade. Think about it…Gold is being hoarded. Whenever gold is dug from the mines, it adds on to the inventory. The amount of gold is ever increasing. Silver is more than a monetary metal. Silver is an industrial metal and the second best commodity after oil. I see silver as a miracle metal. Everything we are working on, we need silver. For example, look at the laptop and this iPad that I am using for this video conference right now, they all have something in common. They need silver. Whenever silver is dug from the ground, it is being used up. Most importantly, the supply for silver is low and the demand is very high especially in the electronic world that we are living in right now. I believe that Year 2012 will be a fantastic year for silver. Looking at the demand for silver over the past few years, I can only see silver price moving up. However, I do see risk in investing in silver as well. I’m worried about the manipulation in COMEX. If COMEX changes the margin requirements again, silver investment especially paper ones, would face huge danger. From what you mentioned, I assumed you are more pro towards owning a silver bullion as compared to paper silver. Yes. I believe that if you cannot hold it, you do not own it. We are not only buying gold and silver as investments but we are buying them as a form of protection as well. In a hyper-inflationary environment, you have got to use the gold and silver coins as money. That’s why it is important for you to hold physical silver. You started True North Asia to provide gold and silver bullion to customers? What is the difference between buying bullion from True North Asia and the banks? True North Asia does not provide gold bullion because the banks are more competitive in terms of prices. However, the banks in Malaysia do not provide silver bullion. We see this as a niche market and that’s how we started SilverMalaysia.com to provide silver bullion to the public. Other than gold and silver, are there other things you invest in? I have been investing in stocks since age 21. There are few stocks that I still hold till today. I also invest in real estate. At this point in time, I am waiting for a crash in the Malaysia’s real estate market before I put my foot in. I am also investing in land that is in the development stage. In essence, I have 3 main holdings –equities, commodities and real estate. Another commodity that I am looking at will be oil and gas which I am in the midst of doing my research right now. I believe that the days of cheap oil is almost over. The supply of oil has been very low. I am studying strategies to profit from this upcoming panic in oil. 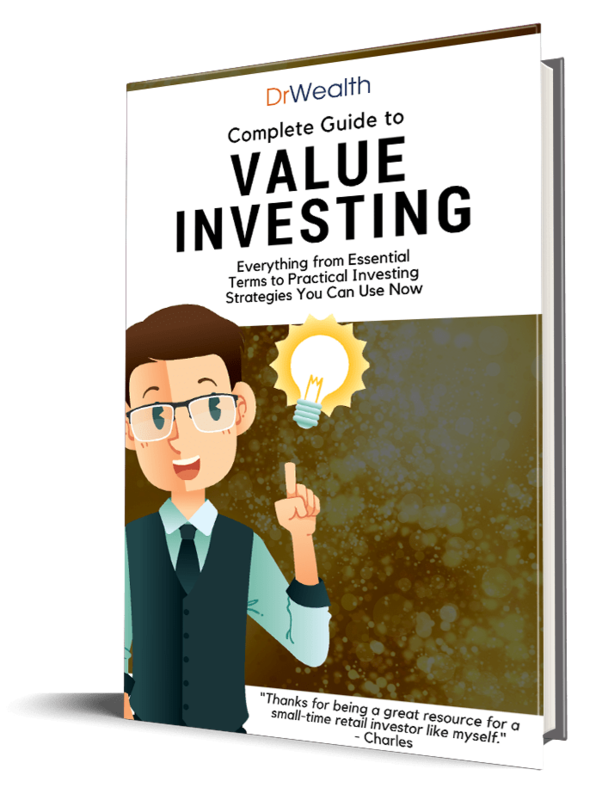 Judging from the things you invest in, the hard assets, you are really expecting an inflationary environment. Have you consider buying paper assets like commodity ETFs on top of the hard assets that you own? I did invest in Gold ETF in Singapore many years ago but I’ve sold them in Year 2011. History have shown that whenever a country goes into fiat currency which is money being printed and promised by the government, it only takes 40 years for the country to go into a hyper-inflationary environment. Right now, for the first time ever in history, the whole world is in fiat currency. Money that is used by the whole wide world is being backed by no real hard assets but by promises. I believe hyperinflation will be the next concern the world is going to face. The problem with owning physical bullion is that the spread between buy price and sell price is higher than transacting a paper asset such as gold ETF. You are right about the buy sell difference. However, I do not buy and sell within a year. I’m not a trader. Every time I buy, I am looking at a longer term of 3-5 years or even 8-10 years. I do not see the problem for myself. How about storage cost? You would probably need to pay for a space in the bank or get a safe at home? An ETF would have the advantage in this area by sharing the cost with many investors. You would have to pay about 1% storage fee a year. Think about it…When you go into Unit Trust, you will also have to pay 1.7% fund management fees every single year. There is no difference to me when you compare it. Gold and silver are actually negative yielding assets, whereby they do not reap dividends like stocks and in addition, you have to pay for storage cost. The concern is that the price of the precious metals do not rise to as much as people would expect, and yet they have to pay for storage costs over a long period of time. Is this a concern for you? We are looking at gold and silver as an insurance for money. If I want to go for dividends or rentals, I would rather go into blue chip stocks and properties. As for gold and silver,I am merely converting my paper money, which is depreciating, into real physical money. In essence, you are looking at gold and silver as another form of ‘cash’. Does True North Asia buy back the silver that was bought from the company? Yes, we only buy back the silver that we sell. Would you share with us the weightage in your portfolio? My portfolio consists of 50% silver. The rest of it is in property and stocks. I usually go for stocks with relatively good value. I’ve also invested in some stocks in Singapore. I do enjoy looking at REITs. Comparing REITs in Singapore and Malaysia, I would prefer the former due to higher transacted volumes. When you invest in stocks, do you adopt a buy and hold strategy or you have intention to cash out at a certain time in the future? I do have the intention to cash out. I only monitor the very few stocks so that I know what is going on. Just like my business, I believe in focus rather than broad diversification in too many different stocks. I am more favorable to buy and hold. However, when a stock falls out of my criteria, I will sell the stock. What do you think is the common problem in average people in relation to money? Why they want to be rich but cannot be rich? Most people want to be rich but they are not working towards becoming rich. It is merely a wish, it is not a must. Theyareunwilling to sacrifice and do whatever it takes to get there. They are not willing to discipline themselvesand sothey will only continue to blame, justify and give excuses. How do you ‘teach’ your students to be disciplined? We realised giving talks alone is not enough. People get excited but when they go home, most people do not practice what is taught and they tend to forget what they have learned. What we are trying to do this year is to move towards building communities of like-minded people through focus and support groups. We are creating 2 support groups. One of them is to support youths who want to learn about financial intelligence and that is where we launched our Financial Intelligence Academy. The other support group is for women who want to achieve financial freedom. We call it the G-Circle. What is the rationale for targeting youth and women? We have been working with many youths in universities and educational institutions. We find that many of them want to change and often ask us how and what is next after attending my seminars. That is how we saw the importance in creating a support group to help them. For the women support group, I have a Singaporean female business partner and together with a top financial coach in Malaysia to manage the G-Circle. They share the same passion to help ladies to stand on their own feet. That is how we came up with the G-Circle community. Probably also because of your age, you can connect to the youths much better and it is more sensible to reach out to them. I believe you do conduct talks for older folks, do you have problems with them not taking you seriously because of your age? That happened before 4 years ago when I was still around 23 or 24. Just last month, we organized a seminar titled ‘SilverMalaysia.com: Precious Metals Outlook 2012’ and our seminar participants ranged from students, bankers, gold bullion traders, retireesand also a fund manager. When you mentioned about investing in land under development, is it consider land banking? I am not favorable towards land banking. I’m into developmental banking. Land banking is about buying into raw land, waiting for land planners to plan the use of the land and thereafter selling to a developer. What I am going into is the next stage of land banking. The land has been rezoned with approved subdivision planning and we bring in developers to build on the land who will be selling the houses to the end users. At the development stage, everything is calculated and this is where we make profits with assured returns given an assured time frame. Just want to get it right, are you buying the land and selling it to the developer, or are you developing the land yourself? I am buying the land and I leverage on the developer to develop and build the land. When the developer sells the completed units, I share the profits with the developer. I’m just an investor. So there is an arrangement to the proportion of profits you will receive. Yes. We have a joint development agreement. First, it will be passion. I am quite fortunate to know what I want in life at a relatively young age. My key focus is to achieve financial freedom and share my strategies with others who aim to do the same as well. One person who has inspired me is my mum. When my mum was in the network marketing industry, she was doing very well. Her upline who was earning 3-4 times more than her initially ended up bankrupt later on and it got me thinking about it. I realised the key behind all these was financial education. It was really about prudent money management. That is how it sparked my interest towards personal financial management skills. I started adapting the habit of prudent money management and continuously learn to increase my income capability through working income and passive income. However, I believe that passion alone is not enough. When I was chasing after my passion, I faced lots of challenges and obstacles and that bring me to the other attribute which is perseverance. I usually spend my time on YouTube watching videos of successful individuals while exercising in the gym every morning. One of my favourite video clip is Rocky. There is a phrase he mentioned that I kept deep inside my heart. How often do you conduct your workshops and seminars? I conduct an average of 4 to 6 workshops and seminars a month. How do you find time to do so many things? I’m a firm believer in discipline. Every day I have 3 main to-do lists which I must complete before I go to sleep. If I don’t finish them, I don’t sleep. If I finish them early, I will go for a game of squash. If someone is interested in attending your course, how does he go about registering for it? They can go to my blog, Jonathan-Quek.com. Under the events page, they can look at the details of the next talk and get in contact with the organiser to enrol for it. The events will be updated and interested parties can just go to his blog, Jonathan-Quek.com for more details. 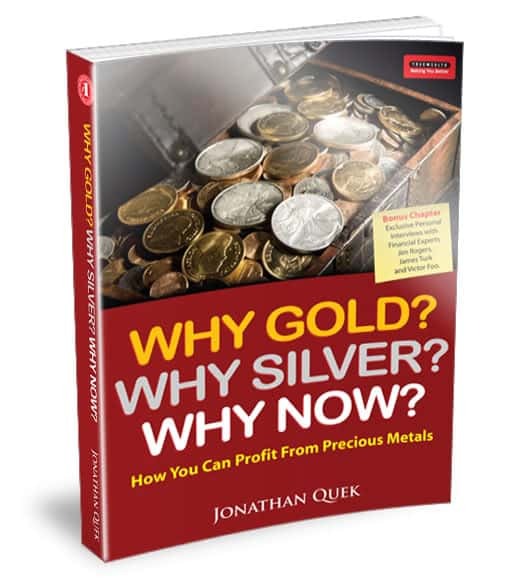 Jonathan also have a book, “Why Gold? Why Silver? Why Now?”, but you would have to wait for the second edition as the first print has been sold out. We have come to the end of the interview. I appreciate your time and the information that you have shared with us. Thank you so much. Thanks for inviting me. I am also very bullish on silver. If you remember, during my interview, I mentioned that I had bought spot silver (XAGUSD) just before the interview.